Flying Blue, the mileage program of SkyTeam partners Air France, KLM and Air Europa, offers Promo Awards each month, through which you can book award flights for as little as 50% of the miles normally needed on certain routes and in specific cabins. While these awards used to be released every two months, Flying Blue now updates them each month instead. The list of awards you can book between September 1-31 for travel November 1-December 31 is now up on the Promo Awards page. Even though Air France is a partner of Delta, you can not book these awards with Delta SkyMiles. Detroit to Europe on KLM: 50% off economy class – 12,500 miles each way, 25,000 miles round-trip, travel dates November 1-December 31. Mexico to Europe on Air France: 25% off economy class – 18,750 miles each way, 37,500 miles round-trip, travel dates November 1-December 31. 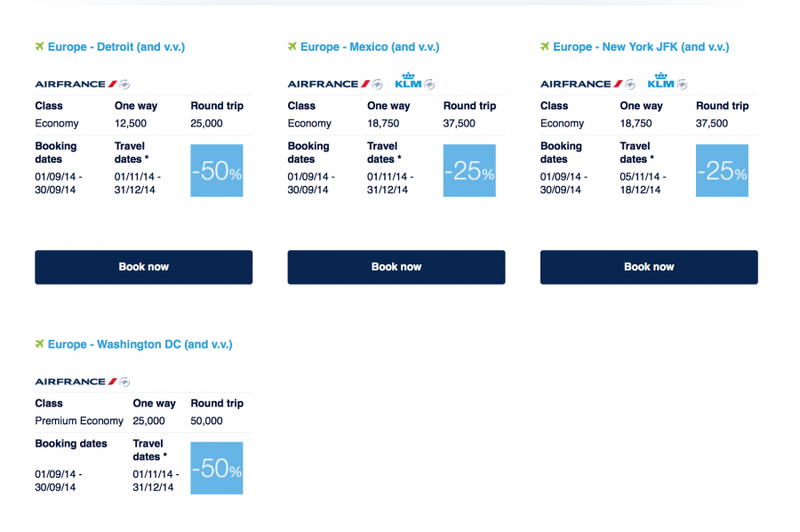 New York (JFK) to Europe on Air France and KLM: 25% off economy class – 18,750 miles each way, 37,500 miles round-trip, travel dates November 5-December 18. Washington D.C. to Europe on Air France: 50% off premium economy – 25,000 miles each way, 50,000 miles round-trip, travel dates November 1-December 31. There is lots of availability in coach from Detroit to Paris for 12,500 miles each-way. A coach award from Detroit to Paris in November would cost 25,000 miles plus 259.70 in taxes in fees. To book these same flights outright would cost $1,311.92, so the redemption option offers 4.2 cents per mile in value, which is much greater than my most recent valuation of 1.3 cents apiece for Air France Flying Blue miles. If you don’t have enough Flying Blue miles (or any at all), there are a few ways you can stock up on them relatively quickly. The program is an instant 1:1 transfer partner of Amex Membership Rewards, the program of cards like the Premier Rewards Gold Card and Platinum Card from American Express. Flying Blue is also a 1:1 transfer partner of Starwood Preferred Guest, which offers a 5,000-mile bonus on transfers of 20,000 points. 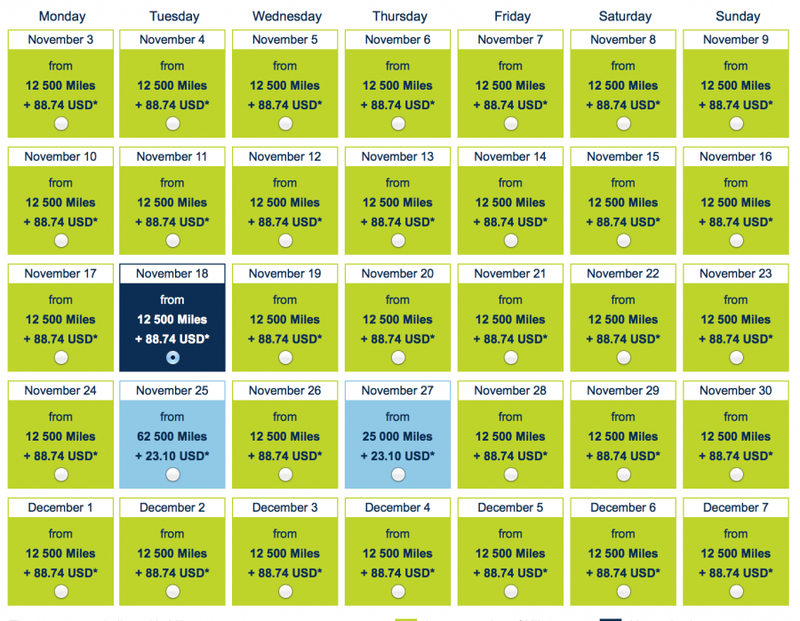 So at the Promo Awards rate, you could book a round-trip economy award ticket to Europe for just 20,000 SPG points. Just note that transfers can take a few days. The current sign-up bonus for both the personal and business Starwood Preferred Guest cards from American Express are 25,000 points when you spend $5,000 in 6 months. So even if you never fly Air France/KLM, or if you bank your SkyTeam miles elsewhere, there are still plenty of options to top up your account quickly using points you might already have. Do you plan to book any of these awards? Let us know your thoughts and plans in the comments below.